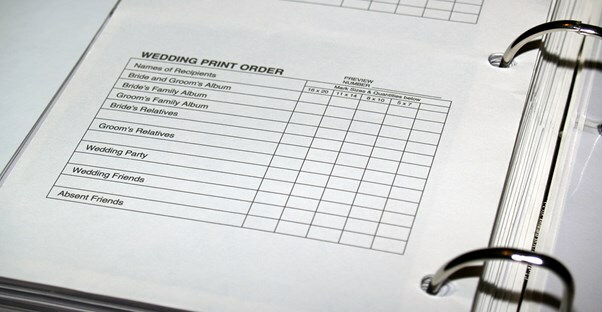 Planning a wedding is an exciting, but also hectic time in life. You want to start off on the right foot by having your wedding invitations ready to go out in plenty of time. Your wedding theme will be reflected in your favors, your table centerpieces, and in your invitations. The invitation is the first glimpse your guests will have of your wedding, and it will pave the way for the rest of the wedding. You can’t begin picking out invitations until you’ve nailed down the theme, so it’s imperative you do this first. Using your theme for guidance, go through invitation books at printing shops, and websites to find one that goes along with your wedding vision. Narrow the invitations you like down to ten styles and order sample invitations of each of these. You want to see your options in person before ordering. After you pick the invitation that you like the best, you will need to work on the wording. There are many samples available online. You need to know the basics (date, time, and place) as well as decide how you want to portray the ceremony information. This will all depend on who is involved in the wedding. Parents or step-parents names may need to be added if they are the ones hosting the wedding. Write a sample and check over it several times. Have others check the information for you as well, to make sure there are no typographical errors. Order the invitations about three to four months before your wedding. You need to have a guest list with everyone's address. You will need to address the inner envelopes without first names. For example, address the inside envelope to a married couple as Mr. and Mrs. Smith. The outside envelope has the first name, such as Mr. and Mrs. William Smith. There are several rules for addressing wedding invitations that you should adhere to. Make sure that you have enough postage on each invitation. Take a completed invitation to the post office to be weighed before you do the bulk of invitations. You will need to put a stamp on the return envelope as well as postage on the outside of the entire invitation. Invitations should be mailed out eight to ten weeks before the wedding. This will give people time to give a response as to whether they are attending or not. After mailing out invitations, you simply wait and keep track of who will be attending. You’ll need to know exactly how many people to expect at the wedding in order to have enough seating and food for everyone.